Give me some reassurance, please. Our process starts with a detailed inspection of all fabrics upon arrival. General condition, repair needs and expected outcome are evaluated, and the information collected determines how we proceed on a case by case basis. Cleaning and repairs are all performed in-house by our own specialists. We have a stunning success rate with all types of outdoor fabric items from awnings, patio furniture cushions, boat enclosures, sails, tents, and more. Most customers are amazed at the results we produce, in fact, many clients claim the fabrics look as good as new. We can usually make a marked improvement, or we will let you know otherwise. Why use our service instead of getting new fabrics? Our service is much less expensive than most replacements. Buying replacement fabrics is inevitable and sometimes you just need a change of color or design, but if the issue is appearance due to dirt, mildew, bird droppings, etc., our service will make you feel confident about your decision as well as only spending a fraction of the cost of replacement. Do you clean fabrics by hand or by machine? In today’s world of automatic everything, we are a unique breath of fresh air. We do it all by hand. We have determined through years of experience that the human element is necessary in achieving the best results possible. Subtle choices made by our technicians during the cleaning process make the difference between a good job and a great job. Mechanical action from a washing machine plus the fact that most outdoor fabrics have grommets or other hardware, can cause excessive wear and tear on fabrics. Does your process get rid of mildew? Can you restore fade, do you paint fabrics, or can you get tar, paint, or tree sap out? No, sorry, with the exception of tree sap, which may show improvement after being cleaned. Can you get oil stains out? Lots of factors come into play with oil, such as contaminants and additives, the age and condition of the fabric and how long the oil has been there. Generally, oil stains on fabric have a 50/50 chance of being removed completely. We use the term water repellency, not waterproof. After cleaning, protectors are applied which add water repellency, stain protection and inhibit UV damage and mildew growth. Does the cleaning process cause shrinkage? No. Our protector sometimes ‘puckers’ up the fabric, making it appear to have shrunk ever so slightly, but in the rare case that happens, wetting it will eliminate that. No. It may, however, push stitching that is failing over the edge. Thread made of cotton or blends can weaken from UV exposure. The thread we use for manufacturing and repairs carries a lifetime stitching warranty, so you can be sure your item holds together throughout the life of the fabric. When proper products and procedures are used, cleaning is safe and will likely extend the useful life of the fabric. Can I send items for repair only with no cleaning? Yes, absolutely. We have a full service sewing department. 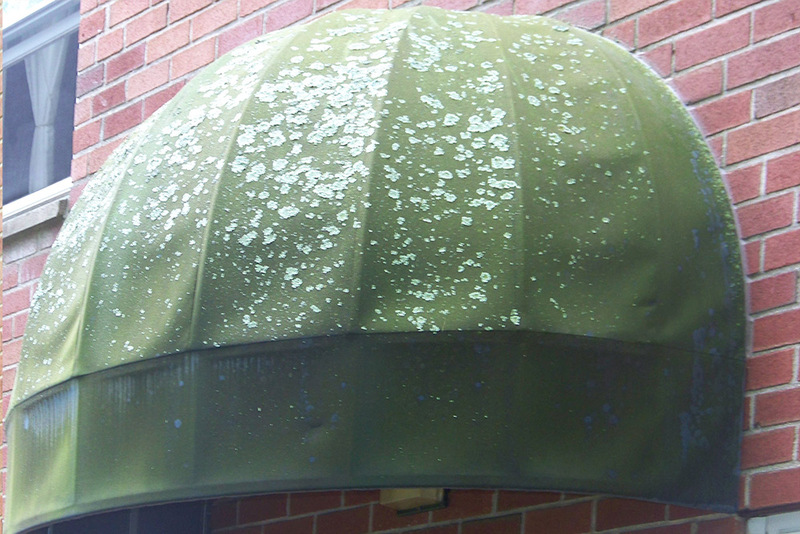 Our head sewer has over 25 years of experience in residential and commercial awning manufacturing and marine repairs. It depends on the time of year. Our longest turnaround is during March through May when we get the bulk of our work. The shortest is during the summer. It’s best to get your seasonal items to us in early fall. How do I place a product order? 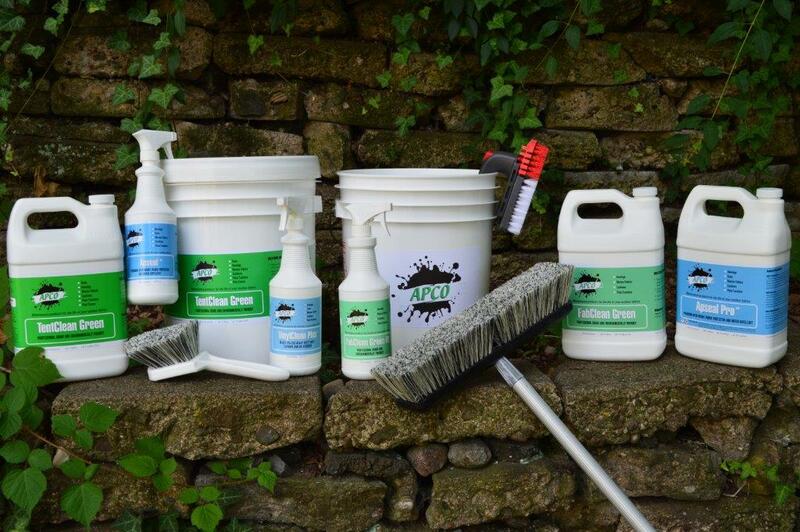 APCO products can be purchased online at our secure website at www.cleancanvas.com. Or, you may call us toll-free at 800-542-3009, fax us at 203-397-7402, or e-mail us at info@cleancanvas.com. Feel free to call or email us. We are always happy to help you enjoy your outdoor fabrics!